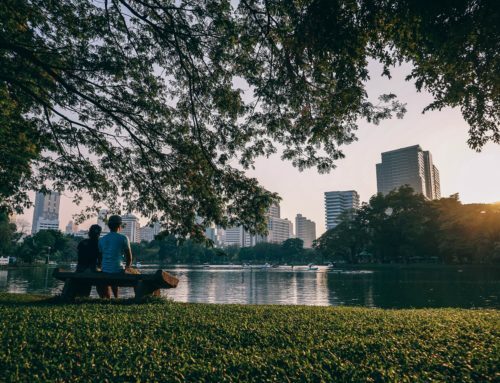 Formerly a dry dock for barges and warships under the care of the Royal Household and the Royal Thai Navy, the dock and barges suffered severe bombing damage during World War II. 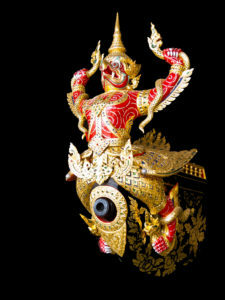 In 1949 they were restored by the Fine Arts Department as part of the Thai cultural heritage. Repairs were completed and the dock became the National Museum of Royal Barges in 1972. 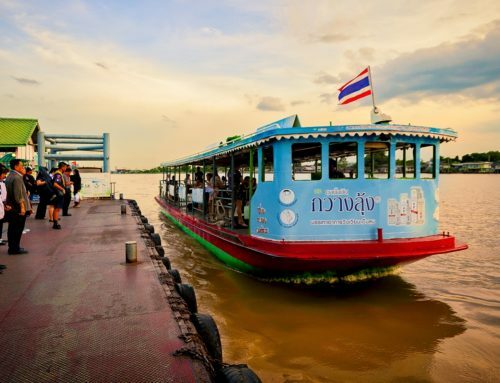 There was a time in Bangkok when the Chao Phraya River and its tributaries were the most important connectors and boats the main mode of transport for all, even royalty. 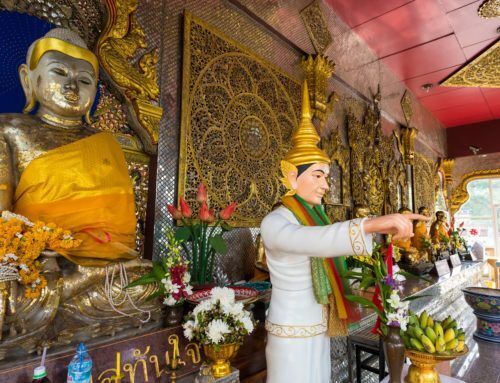 This practice dates back to the Ayutthaya era, when travel for commoners and royals was by boat. The royal barges are slim ornamental vessels that are traditionally used in ceremonial processions. At this museum you can discover eight of the country’s most unique and stunning vessels: the Royal Barges. 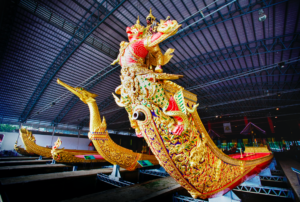 These boats are reserved for special ceremonies and state occasions like the very rare Royal Barge Procession, and have only made an appearance on the water 16 times in the last 65 years. Each is carved from huge pieces of teak, their prows engraved with mythical creatures, gilded in gold and intricately decorated with tiny shimmering pieces of glass. On exhibit is the Suphannahong, the king’s personal barge and most important of the boats that can be seen here. 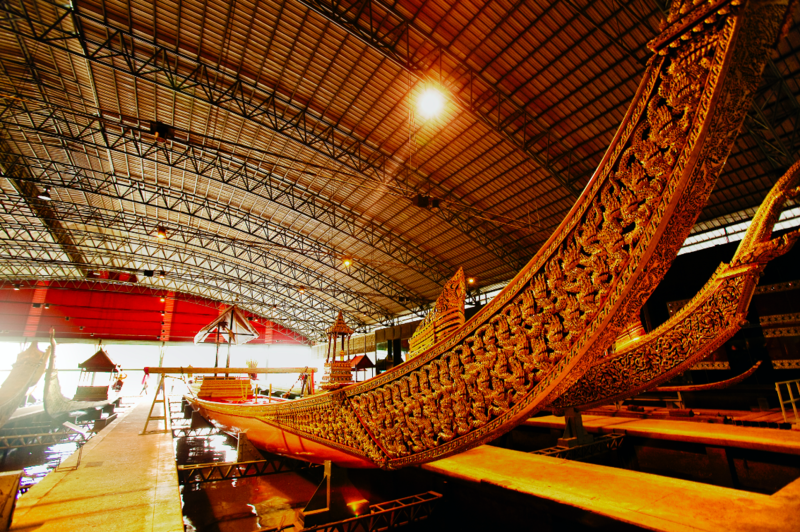 Made from a single piece of timber, it’s said to be the largest dugout boat in the world. The name means Golden Swan, and a huge swan head has been carved into the bow. 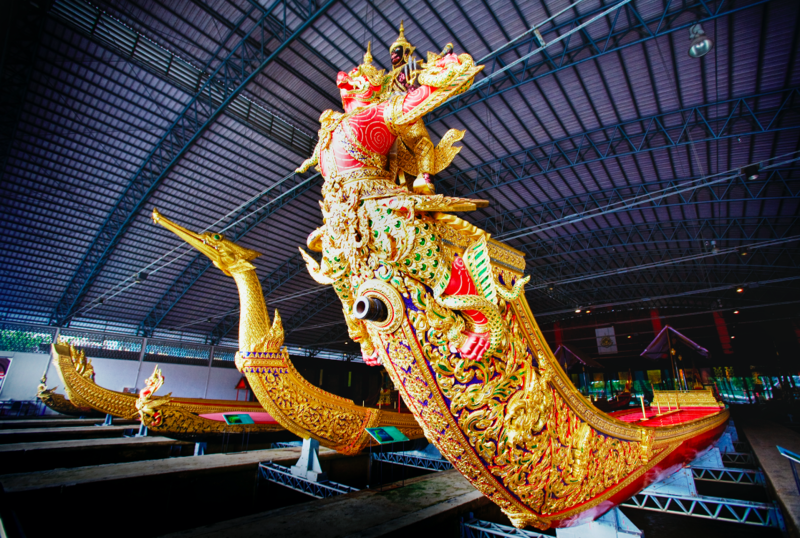 Lesser barges feature bows that are carved into other Hindu-Buddhist mythological shapes such as the naga – a mythical sea serpent, and garuda – Vishnu’s bird mount. Historic photos on display help you envision the grand processions in which the largest of the barges would require a rowing crew of 50 men, plus seven umbrella bearers, two helmsmen and two navigators, as well as a flags man, rhythm keeper and chanter. 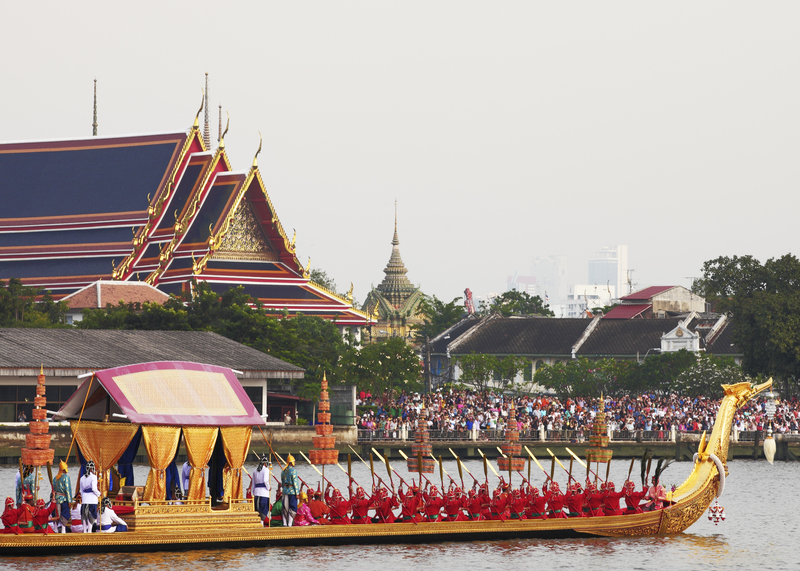 Today, the royal barge procession is an infrequent occurrence, most recently performed in 2012 in honour of the late King Bhumibol Adulyadej’s 85th birthday. Each of the eight royal barges has a sign indicating the name, the year of construction or renovation and the number of crew it requires to operate it. Given that the procession doesn’t happen very regularly you will have to be lucky to catch the boats on the river, but the advantage of the museum is you get to see them up close. Do bear in mind that some of the barges might not be in the museum in November and the beginning of December as they prepare for the Royal Barge Ceremony. 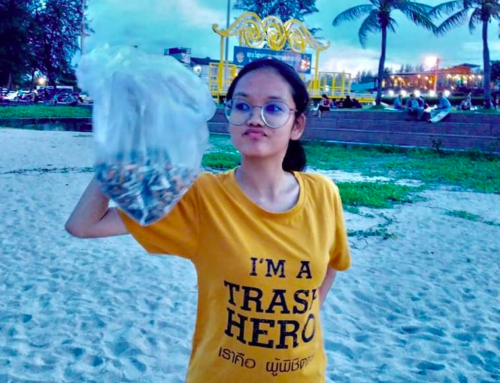 Getting there: The best way is to board the Chao Phraya Express Boat to Wang Lang Pier (N10), then make the short walk to the museum. 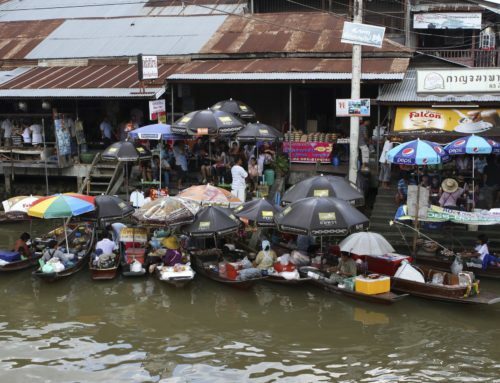 Or hire a long-tail boat to tour the Bangkok waterways and include the Royal Barges Museum in your itinerary. The warehouse museum housing the barges can be very hot, and you may want to support the little bar there that’s called ‘We have soft drink’. It’s a friendly spot and they’re always happy to give you additional information about the area.